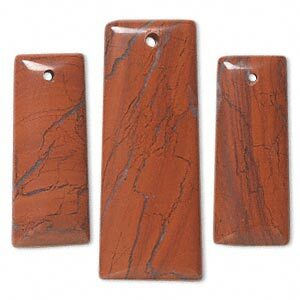 Focal, red jasper (natural), (1) 50x20mm and (2) 36x14mm top-drilled rectangle, B grade, Mohs hardness 6-1/2 to 7. Sold per 3-piece set. 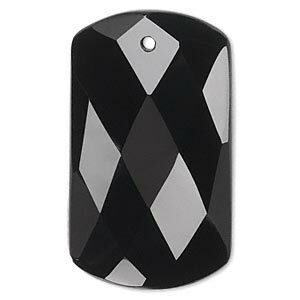 Draw the eye to jewelry designs with striking gemstone focal components in a variety of top-drilled rectangle shapes. Machine-cut and machine-polished for precision shapes and an even surface. Sizes may vary from focal to focal. 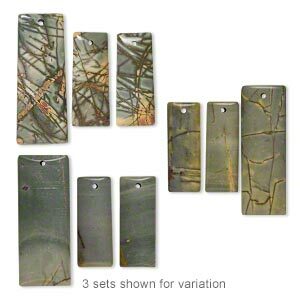 Focal set, spiderweb jasper (natural), one 50x20mm and two 36x14mm double-sided top-drilled rectangle, B grade, Mohs hardness 6-1/2 to 7. Sold per set of 3. 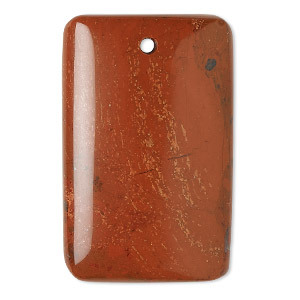 Focal, red jasper (natural), 40x25mm hand-cut top-drilled domed rectangle with flat back, B grade, Mohs hardness 6-1/2 to 7. Sold individually. 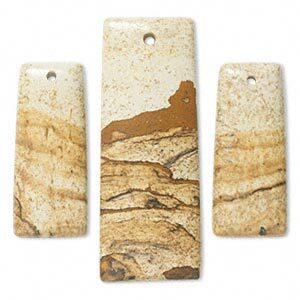 Focal, picture jasper (natural), (1) 52x20mm and (2) 35x15mm rectangle, B grade, Mohs hardness 6-1/2 to 7. Sold per pkg of 3. 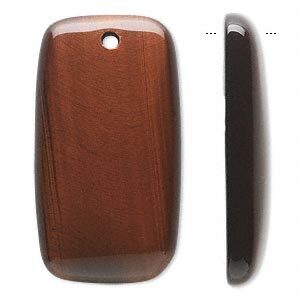 Focal, red tigereye (heated), 40x22mm rectangle, B grade, Mohs hardness 7. Sold individually. 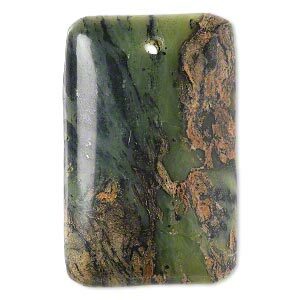 Focal, black onyx (dyed), 48x28mm faceted rectangle, B grade, Mohs hardness 6-1/2 to 7. Sold individually. 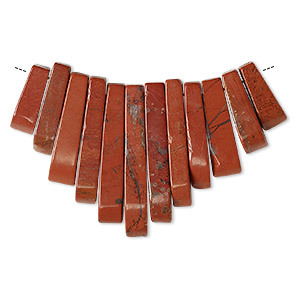 Focal, red jasper (natural), 10-29mm graduated mini-fan, B grade, Mohs hardness 6-1/2 to 7. Sold per 13-piece set. 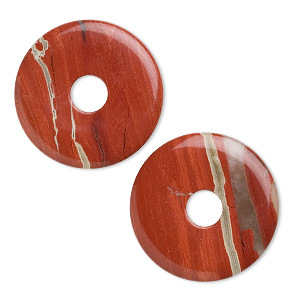 Focal, red jasper (natural), 40mm round donut, B grade, Mohs hardness 6-1/2 to 7. Sold per pkg of 2. 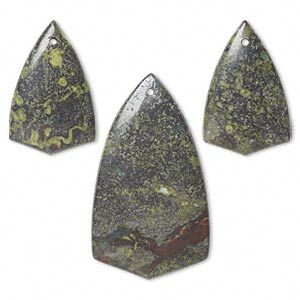 Focal, dragon blood jasper (natural), (1) 50x27mm and (2) 33x21mm top-drilled shield, B grade, Mohs hardness 6-1/2 to 7. Sold per 3-piece set. 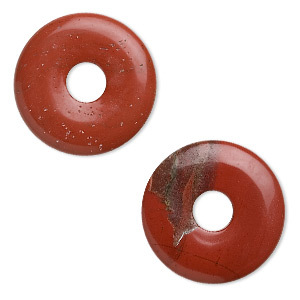 Focal, red jasper (natural), 30mm round donut, B grade, Mohs hardness 6-1/2 to 7. Sold per pkg of 2. Focal, brown crazy lace agate (natural), 40x25mm hand-cut top-drilled domed rectangle with flat back, B grade, Mohs hardness 6-1/2 to 7. Sold individually.